A car dealer will be just as willing to take a leased car in trade as it will for a vehicle with an existing conventional car loan. With a leased car to trade, the dealer actually has more options to get the potential buyer out of the lease and into a new car. However, trading a lease may require a significant amount of out-of-pocket cash compared with waiting until the lease terminates, turning in the car to the leasing company and then buying or leasing another vehicle. 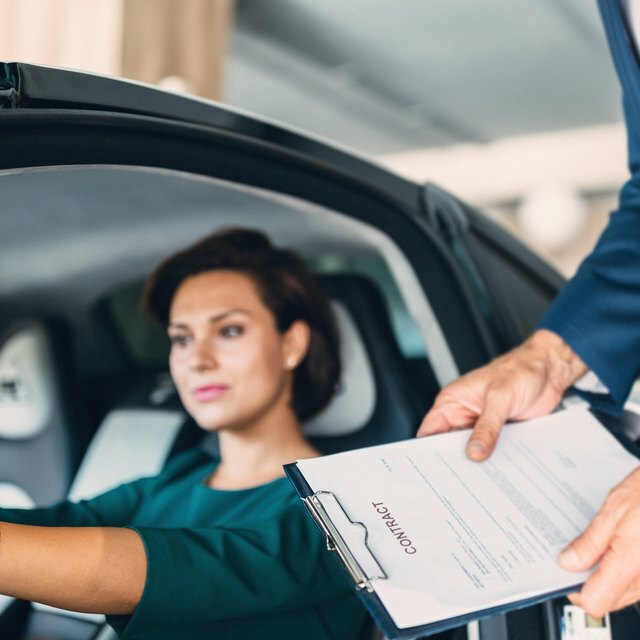 Trading in a leased car before the lease is up requires researching the car's trade-in value and lease payoff amount, visiting the dealership to discuss your trade-in options and negotiating the down and monthly payments for the new vehicle. Obtain the payoff amount left on the existing lease contract. A recent lease bill will list a phone number to call, and the statement also includes the account number you will need to work your way through the leasing company's automated phone system. Make a note of the date through which the payoff amount is valid. Look up the trade-in value of the leased car. Several auto value websites provide this information, and it does not hurt to get a value from at least two. Compare the trade-in value of the car with the lease payoff amount. If the lease payoff is much higher – measured in thousands of dollars – it will be more expensive to trade out of the leased vehicle. Drive your leased car down to the dealership of your choice to buy or lease a new car. Explain to the salesperson that your current vehicle is leased and provide her with the payoff information on the lease. While you are picking out and test-driving cars, the dealership's used car manager will evaluate your trade-in and put a trade value on the car. Ask the salesperson to go over the options to get out of your lease before starting serious negotiations on the purchase of the new car. The dealer has two ways to handle the lease. One is for the dealer to give you the trade-in value for your car and pay off the lease to buy the car from the leasing company. The difference between the trade value and lease payoff will be positive or negative equity to be accounted for in the new car deal. Another way to get out of a lease is to write a check for the remaining payments and turn the car in to the leasing company. The dealer can include this cost into the new car deal and handle the lease turn-in. Whichever option has the lowest cost can be used to minimize the impact of the lease trade on what you have to pay to get a new car. Trading your leased car in at a dealer of the same brand may be less of a financial hardship, especially if the leasing company is captive to the manufacturer. In this case, the dealer may be able to get a lower payoff from the leasing company than what was quoted to you. Negotiate with the salesperson and dealership sales management on the amount of cash down payment and monthly payments you must pay to get out of your lease and into a new car. The information about your trade value and payoff will help you make realistic counteroffers to what the dealer wants you to pay. Keep negotiating until you agree on down and monthly payments that are comfortable for your financial situation. While it is always possible to get out of a lease early, it can be very expensive to do so. If you cannot negotiate an acceptable offer from the dealer, go home with your leased car and try again in a few months after you have made more payments on the lease. As a general rule, you cannot get out of a lease car and into another vehicle and lower your payments at the same time. Honda Conyers: How Can I Terminate My Car Lease Early?